Stradun Dubrovnik is where you will find the cafes, the shops and the restaurants. This is the place to see and to be seen. 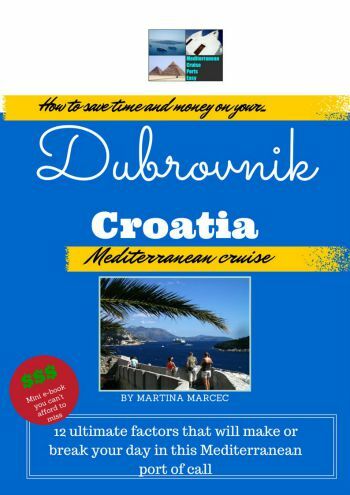 What is Las Ramblas for Barcelona, Champs d’Elysees for Paris, Oxford Street for London and Grand Canal for Venice, is Stradun for Dubrovnik. The place to see and to be seen! 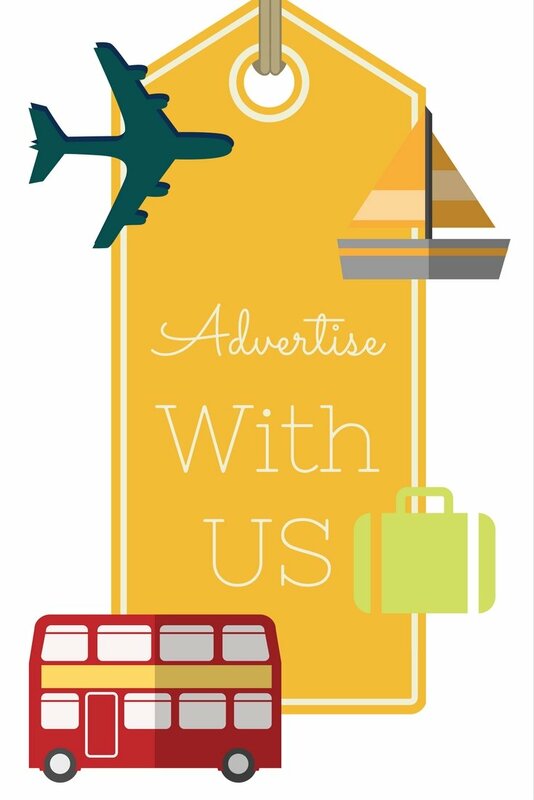 For both everyday people like you and I, but also celebrities and royalties. So keep your eyes open, you never know, on Stradun, Dubrovnik you might bump into some Dubrovnik regulars: Roger Moore, John Malkovich, Sharon Stone or Caroline of Monaco. All shiny and glowing, from hundreds of years old marble, smoothened by millions of feet that have walked over it, Stradun of Dubrovnik is a must see for every visitor and every Mediterranean cruise ship guest. 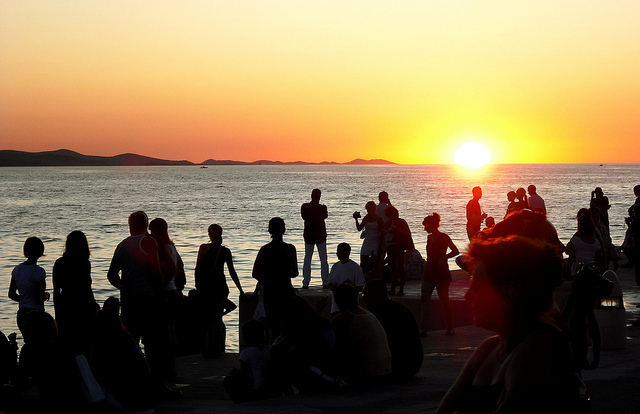 No matter what transportation you choose to get to Dubrovnik Old Town from the port of Dubrovnik, you will be dropped off by the Pile Gate, the main entrance into town. 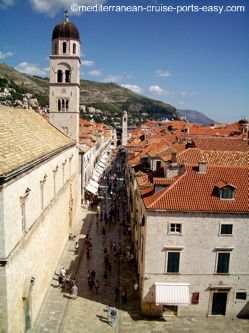 That’s where you will enter the Stradun, Dubrovnik too, the longest (292 meters) and the widest street in the town. Actually, historians say there is an interesting story connected to the fact that this street is unusually wide for Dubrovnik. They say that this street used to be a sea channel that separated two sides, two cliffs of the settlement that was founded in the early Middle Ages. If you look down the little narrow streets to the side of Stradun you will really see them ascending up those cliffs! With time, this channel got filled up and that’s how Placa, which is its original name, became the widest street in Dubrovnik, now connecting two sides of the settlement. As soon as you enter Stradun in Dubrovnik, to your left, you will see very steep stairs going up the wall. Very often, there is a long line of people standing all the way up those stairs, even down on the street. 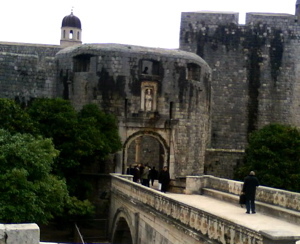 This is where you enter the famous walls of Dubrovnik and that will explain the crowds constantly gathering in this area. On the right, there is the famous 16-sided great Onofrio’s fountain. This fountain is the romantic little spot by which you can stop, sit down or simply freshen up with its clear cool water before you head further down the Stradun, Dubrovnik. Back to the left, there is the beautiful Renaissance church of the Holy Saviour and right next to it, the Franciscan monastery. What you’ll see along the whole length of Stradun, are the stone houses that were built after the big earthquake in 1667. Before the earthquake, Stradun was lined with lavish, ornate palaces. However, in the reconstruction, the focus was more on how to get back to life as soon as possible and the houses got a bit more modest features. At the very end of Stradun, the most notable building is the famous Sponza palace built in the 16th Ct. in a mixture of late Gothic and Renaissance styles. You also cannot miss the small fountain of Onofrio’s that stands in a niche of the city guard façade. 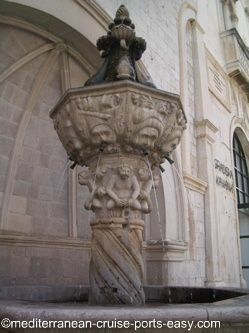 Yes, there are two Onofrio’s fountains on Stradun in Dubrovnik, the great one and the small one. Right in front of the Sponza palace is the famous 18th Ct. Baroque church of Saint Blaise, the patron Saint of Dubrovnik. In front of Saint Blaise church is the biggest symbol of Dubrovnik’s freedom and independence: Orlando’s Column. At its very end, on the right, Stradun opens up onto a square dominated by another attraction, the Rector's palace and the Cathedral with the Treasury. Now that you’ve gotten a good overview of the major attractions of Stradun, Dubrovnik you can sit at one of the inviting cafe terraces, if you’re lucky enough to grab a table! Have a coffee, it’s as good here as on the other side of the Adriatic sea, if not better; enjoy some ice-cream or a little snack before you carry on… there is so much more to see around the Old Town of Dubrovnik!